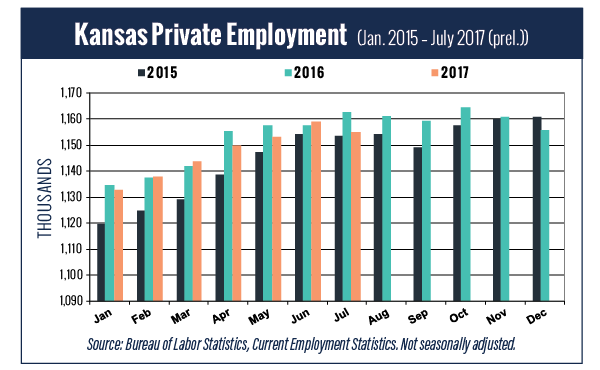 Private employment growth in Kansas has struggled in recent years. Technology changes during the last ten years are driving the economy in new directions. The “Internet of Things” is changing the way businesses operate – how we heat our offices and factories, how we organize our production lines and how and where our employees do their work. Technology is shifting the skills the private sector needs and creating a talent gap in our workforce. The ability for our businesses and educational institutions to upskill and reskill talent as well as to create job-ready talent and to develop a sustainable pipeline of talent are all crucial to the future of our state’s economy. Kansas has a strong education base, but going forward, STEM jobs will grow more than twice as fast as non-STEM jobs. Not all STEM jobs require four-year college degrees. Our state must identify ways to better target workforce preparation (be that a college degree or certified program) to ensure the private sector has the talent supply it needs for the next 20 years.